– the good, the bad, the why and the how. My family is in a state of transition – the official summer break has come to a close and the school term has just begun. For the past 8 weeks, we have enjoyed long lazy mornings and days without structure, but now that school is back it’s time to focus on a daily routine if we want to be successful and accomplish our yearly goals! During the school term, much of my family’s daily routine is habitual, and even though during the break we have set those habits aside, we instinctively pick them up again and make them work for us the very moment the structure of a school day triggers those old habits. Recently, while reading about the science and psychology of habits,(not what you would call light reading, but most definitely interesting!) I discovered that habits never, ever leave us! Did you know that? It had never occurred to me before, but once we have paved those neurological paths in our brain, they are with us to stay! That is not to say that a bad habit can’t be replaced by a good one, or vice versa, but it’s interesting to note that while our consistent actions may illuminate another possible neurological path, those old habits lie dormant under the surface of our new habits. Creativity is as much a verb as it is a noun. If you search for a consistent definition of the word ‘creativity’ you won’t find it. It would be easy to engage in a philosophical tug of war about the concept of creativity – is it the use of imagination or is it the act of turning imaginative ideas into reality? I think it is both, and the way I make sense of it, is to simplify the concept by breaking it down into two distinct parts – inspiration and work! Creativity begins when you recognise inspiration, but it only achieves its full potential when you take the idea from your mind, and transform that idea into something real. And that takes work! But work is good! When we work we are earnestly engaging in an activity, and if we do the same work often enough our brain begins to form the neural super highways that will become the habits we need to sustain us in the future. This is the exact reason you always see creative makers complaining they’ve lost their sewjo one day, and then see them back behind their sewing machines the next! Their creative actions are a habit they have cultivated over time, and their minds were only taking a moment to pause and reset before their brain’s happy chemicals kicked in again under the direction of a creative habit, and they went back to work. So clearly, if you want to create regularly, then you must form creative habits to sustain you. Unfortunately, I don’t think there is a specific set of steps or secret formula that will guarantee successful habits for everyone. We are all unique, and individual habits are built on cues and rewards that are going to be different for each of us, but there are some things we can all do to invite creative habits into our lives. 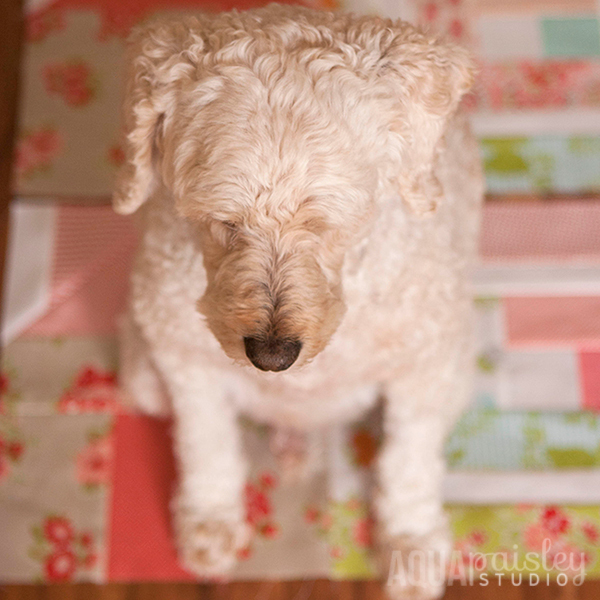 For some, the idea of making a quilt can feel overwhelming, which is why a quilt pattern is broken down into small steps. Building on the step before, a quilt becomes achievable. The same is true when trying to establish a creative habit. Begin by forming mini habits that will support your creative dreams. Mini habits could be anything from cutting out a handful of squares to simply reading a pattern. Try to focus on one small act each day. The idea is to connect you to your creativity and encourage you to be engaged with your craft daily in small increments that collectively make a big difference. This type of mini routine requires minimal willpower to accomplish, and leaves you with a constant feeling of success, which in turn positively reinforces the behaviour. Oliver knows all about positive reinforcement ;). 2 – Make time to do the things you love. We all have the same 168 hours each week, but how many of those hours do you give to doing something just because it makes you happy? My guess is not as many as you should! If your creative work is important to you make the time for it. 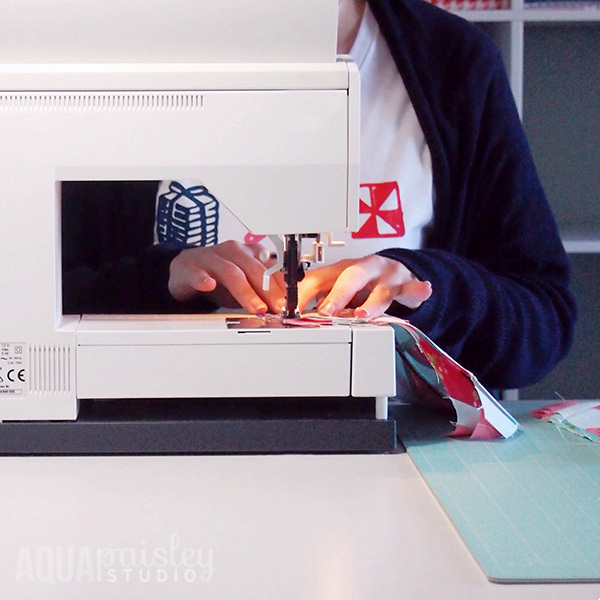 Recently I had a friend ask me how I manage to “find the time to sew” – I very matter-of-factly replied, “I make the time to sew, because it makes me happy!” And you can too. Set yourself a challenge to be creative for at least 15 minutes every day. Even if all you do is ‘play’ with fabric, you are training your brain to recognise the importance of those creative moments in making you happy, and establishing a habit you can then rely on. Ignore the idea of being time efficient and work towards being time effective; use your time to work towards your core goals and values. 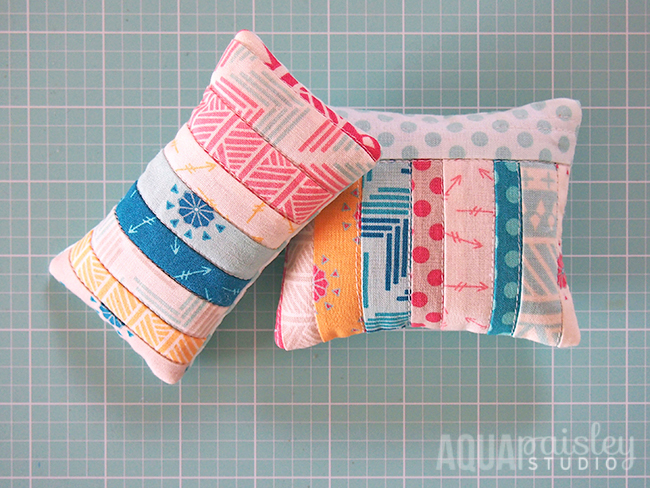 Pincushions are a great way to warm up your creative muscles and they can easily be made in a small amount of time if you want to start and finish something in one session. 3 – Establish a base camp. You need to create space for your creativity to thrive. We need to dedicate space for the things we love in the same way we dedicate time. 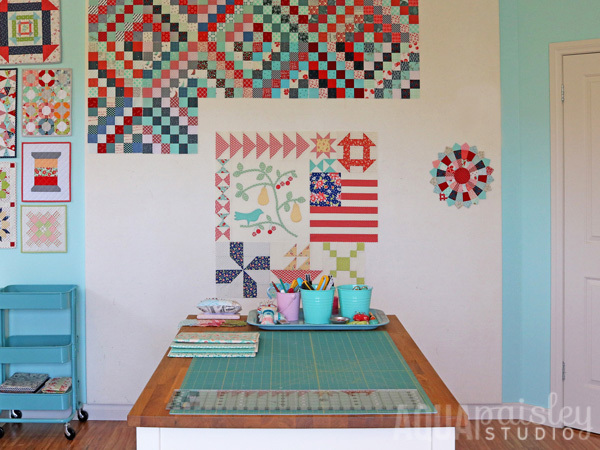 If you are fortunate enough to be able to create in a room dedicated to your craft, then consider yourself lucky – I know I do! But if all the ‘real estate’ you have available to you right now consists of a small corner of another room then don’t feel disheartened – just be sure to have your supplies and tools assembled together in one area so you can get to work on demand. Your environment plays a big role in your behaviour, and if preparing to create is going to require you to exert superfluous energy before you can even begin, then the chances of you actually following through with your intention is minimal. Set yourself up for success by establishing a base camp with everything you need available to you. I have the luxury of my own studio where I create; but it wasn’t always so – in the past I have set up base camp in storage boxes, closets and corners of rooms. Make your space work for you! 4 – Believe in your creative dreams. Successful people aren’t mystical unicorns from a far-off place, they are simply those who have developed good habits and believe in the value of their work. Everyone has an amount of creative potential inside of them that is waiting to be unleashed. You must learn how to leverage your talents and your skills by building habits that work for you and your circumstances. Your creative dreams come from deep within you – shelter them, nourish them, be familiar with them and work towards them every day. 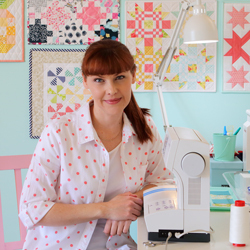 Show up each day to your cutting mat or sewing machine and believe that what you are doing is of worth – with fabric and thread you are able to share a piece of yourself with the world. So, are you ready to build practices in your life that help you focus your creative energy and increase your unique creative contribution to the world? Use the rhythms in your life to build habits that help you produce your best work and BE CREATIVE EVERYDAY with grace and gumption ;). I’m cheering you on from the sidelines!! And if you already find yourself mastering the art of creative habits then I would love to know what works for you – leave me a comment or send me an email! Go. Cut. Sew. Create. And share your story with fabric and thread! I find time everyday to work on some project, whether it is after work, on my lunch break or on my days off. I do not feel complete without spending the time on myself. I think everyone deserves at least that much. Creativity is food for the soul and makes us complete! Thanks for the encouragement. It really is about making the habit of taking time to create! Thanks for taking the time to comment Anne. The more I learn about the psychology of habits the more interested I am in how they relate to our creativity 🙂 !